A free online course, ‘Sustainability, Society and You,’ will start on 6 January 2014. 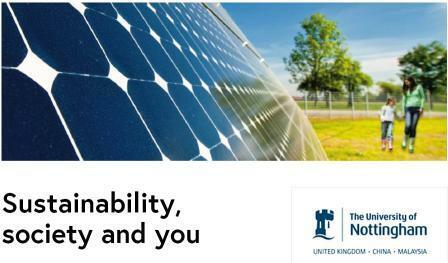 Delivered by the University of Nottingham in partnership of FutureLearn, this eight-week course will provide participants with an introduction to the major global issue of sustainability while helping them discover how they can have a real impact on the future. Although no prior knowledge is required to take this course, participants will be expected to have a mind that is open to new ideas and approaches and also a willingness to reflect upon their own contribution towards a more sustainable society. What do we think about sustainability? Through videos, readings and discussions, course participants will explore sustainability from a variety of perspectives such as economic, political, social, cultural, historical, arts, engineering, business, learning, geography and personal. They will also be encouraged to look at their own behaviours and to find, produce, share and discuss resources on sustainability. The course, led by Dr Sarah Speight (archaeologist, educator and The University of Nottingham’s academic lead on Sustainability), will also feature contributions from academics across a variety of disciplines, supported by expert facilitators. It has been put together using material generated by the university and that from third-party ‘Creative Commons’ licensed sources. FutureLearn, a private company wholly owned by The Open University, facilitates this course. 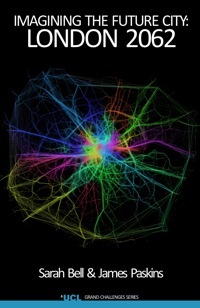 It is behind the UK’s first provider of massive open online courses (MOOCs). The course invites all to join the conversation on Twitter or in blogging with the hashtag #FLsustain. The consultation on a sustainable development framework for the Higher Education Funding Council for England (HEFCE) will remain open until noon on 7 February 2014. As part of this process, two events will be held in Leeds and London in January 2014. Now, HEFCE is reviewing how it supports English higher education’s contribution to sustainable development and is consulting on a framework for its future work. Through this consultation, the body proposes a new vision of how English higher education could contribute to sustainable development, with an emphasis on the sector’s leadership role in society. The consultation document sets out some of the ways the sector can contribute to sustainable development and proposes an overall framework for how HEFCE will support sustainable development in the sector. It encompasses HEFCE’s earlier policy statements on sustainable development and carbon reduction, and will influence its future funding. This consultation seeks comments from everyone in higher education, including students, academic staff and senior leaders. HEFCE refers to the actions and vision articulated in this consultation as a framework in order to embark on a coherent longer-term engagement. 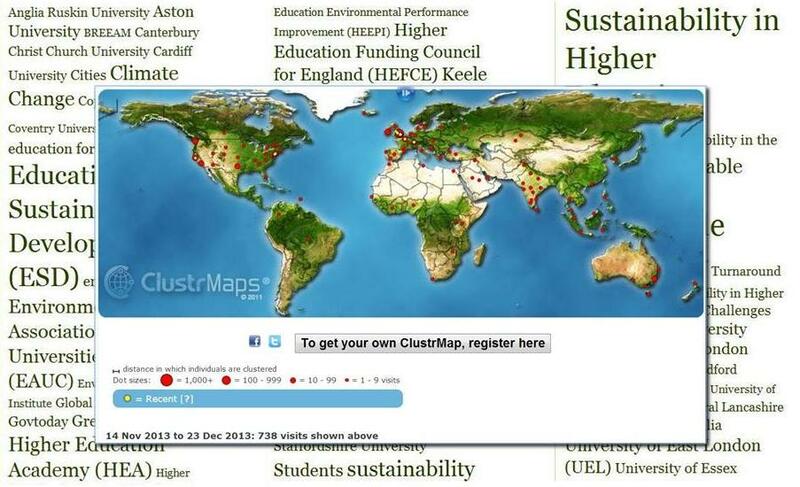 Please email comments and feedback to sustainabledevelopment@hefce.ac.uk by noon on Friday 7 February 2014. Two consultation events will also be held on 9 January in Leeds and 30 January 2014 in London. They aim to celebrate progress and achievements in higher education, to provide a discussion forum for future actions and to facilitate networking on sustainable development. At the Leeds event, to be held at The Queens Hotel, City Square, Leeds, LS1 1PJ, the speakers will include Professor Dame Julia King (Vice-Chancellor Aston University, Committee on Climate Change) and Professor David Hogg (Pro Vice-Chancellor, University of Leeds). Among the speakers at the London event (Mary Ward House, 5-7 Tavistock Place, London, WC1H 9SN) will be Nigel Carrington (Vice-Chancellor, University of the Arts London) and David Pencheon (National Health Service). Steve Egan, HEFCE’s Interim chief executive, and Dom Anderson (Vice-President Society and Citizenship, National Union of Students) will be speaking at both events. The Education for Sustainability (EfS) Masters programme at London South Bank University (LSBU) held its African residential programme 2013 in Kampala, Uganda in October 2013. Fifteen African scholars, the recipients of UK Commonwealth Scholarship awards funded by the Department for International Development (DFID), took part in this programme. Following an extremely competitive awards scheme that attracted over 250 applicants, these 15 scholars were selected for their academic ability and for their leadership abilities in relation to their potential development impact in their countries. Although these participants came from a wide range of work contexts, including education ministries, NGO development programmes, The British Council, HIV and AIDS training, wildlife conservation, environmental journalism, emergency programmes for refugees and university teaching, they all shared a commitment to promoting sustainability for people and the planet. Because this is a distance learning programme, they are able to apply their learning to their work context to achieve an immediate impact. As always is the case, the intercultural elements of the residential gave the scholars an opportunity (often for the very first time) to meet colleagues from different African countries and exchange ideas and learn about their different cultures and traditions. This year, for the first time, a few self paying UK based students joined the group and found it inspiring to be part of such an active international learning community for EfS. This exposure benefitted the EfS academic team too. The EfS MSc programme offers post-graduate qualifications from Continuing Professional Development (CPD) to Masters level. Launch in 1994 in collaboration with World Wide Fund for Nature (WWF), Oxfam and the European Union (EU), this programme was a result of the need identified in the 1992 UN Earth Summit in Rio for integrating environmental and development agendas for paving the way for a sustainable future. Its modules are designed to be applicable to any type of educational or country context and make use of case studies and readings from a range of global regions. 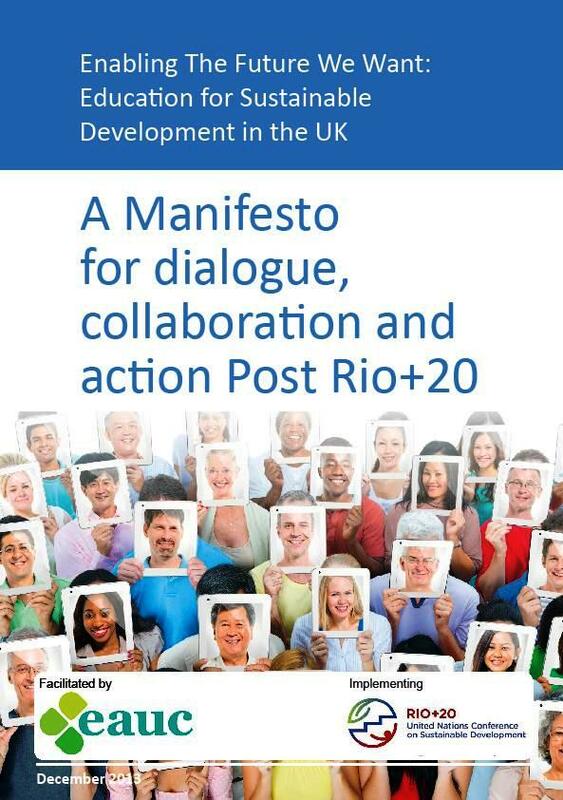 A Manifesto for Dialogue, Collaboration and Action post Rio+20, UK’s Rio+20 Manifesto to strengthen education’s role in sustainable development, will be launched at the House of Commons London on 17 December 2013 (11:00-13:00). This manifesto is facilitated by the Environmental Association for Universities and Colleges (EAUC). This is a free event; however, prior registration is required (For registration, the link to the relevant EAUC webpage could be found below this news post). Hosted by Joan Walley MP (Chair of the Environmental Audit Select Committee), this event will include an introduction to the Manifesto by Harriet Sjerps-Jones (EAUC and University of Exeter); a Roundtable Session led by Ann Finlayson (Chief Executive, Sustainability and Environmental Education SEEd and former Commissioner, Sustainable Development Commission) and Iain Patton (Chief Executive, EAUC); and Witness Accounts – among the confirmed witnesses are Caroline Lucas MP, Steve Egan (Higher Education Funding Council for England HEFCE), Dom Anderson (National Union of Students NUS), university students, youth representatives and school children. The intergovernmental agreements that came out of Rio+20 United Nations Conference on Sustainable Development (UNCSD) (The Future We Want) included commitments to quality education, to improve quality of life, to Education for Sustainable Development (ESD) and to embark on a process towards Sustainable Development Goals. 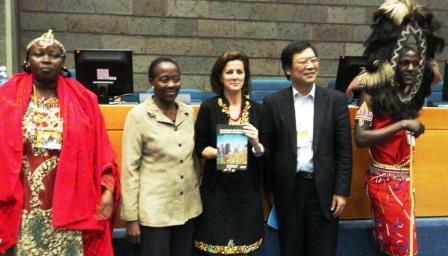 The Conference also emphasised ESD’s key role in achieving a sustainable future. UK’s Rio+20 Manifesto, the result of a UK-wide consultation from November 2012 to May 2013 in response to The Future We Want, calls on Governments (UK government and the devolved governments of Northern Ireland, Scotland and Wales), education providers, NGOs and civil society in the UK to work more closely together to strengthen the role of education as an enabler of sustainable development. A new book, Imagining the Future City: London 2062, was launched at University College London (UCL) in November 2013. The book, edited by Dr Sarah Bell (Senior Lecturer, Department of Civil, Environmental and Geomatic Engineering UCL) and Dr James Paskins (Co-ordinator for the Grand Challenge of Sustainable Cities and the London Agenda at UCL), aims to open discussion about the future of London. This collaborative effort of forty contributors is based on UCL’s London 2062 project (2010-2012), which Professor David Price (Vice-Provost for Research at UCL) instigated as part of the Research Grand Challenge of Sustainable Cities, driven by his vision of bringing the breadth of institution’s urban research to bear on the future of London.